PokerStars.ES is one of the European divisions of the largest poker room in the world. The Spanish reservation has been working since 2001. For many years, it was a closed room not available to players from other countries. But due to the decline in popularity among players and the reduction of tax collection, poker regulators in some European countries have started negotiations on the possibility of combining players’ pools. In the summer of 2017, a principled agreement was reached on the establishment of the Europool in 2018. Spain together with France quickly promoted this process. At the end of December 2017, the Spanish regulator Dirección General de Ordenación del Juego (DGOJ) announced its readiness to issue new licenses. And PokerStars got them first in both countries. 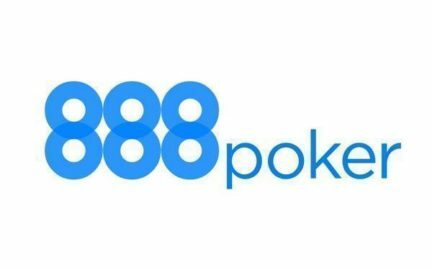 January 16, 2018 players PokerStars.ES and PokerStars.FR began to play at the same tables. Soon to join them and the Portuguese players. 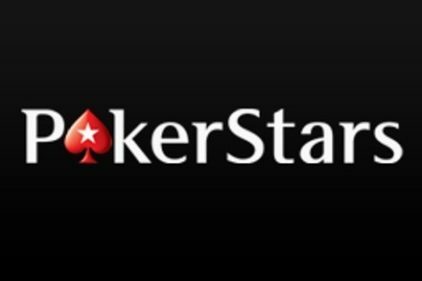 From now on, PokerStars.ES became part of PokerStars Europe Network. At the same time, it was announced that players from third countries could register in the room. 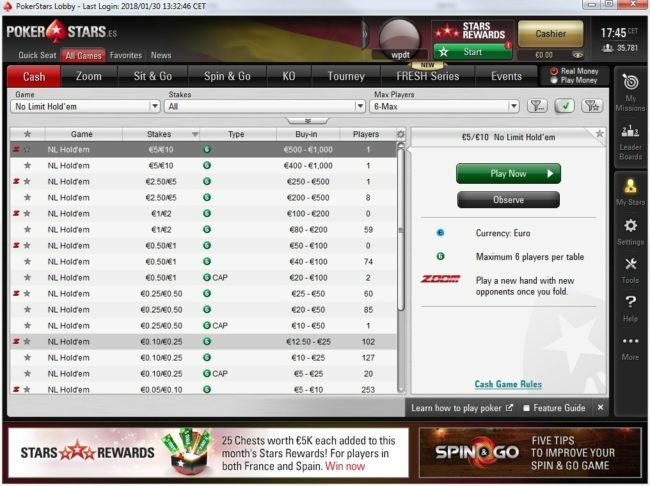 PokerStars.ES is a large poker room operating on all the familiar poker client and having one of the weakest players. 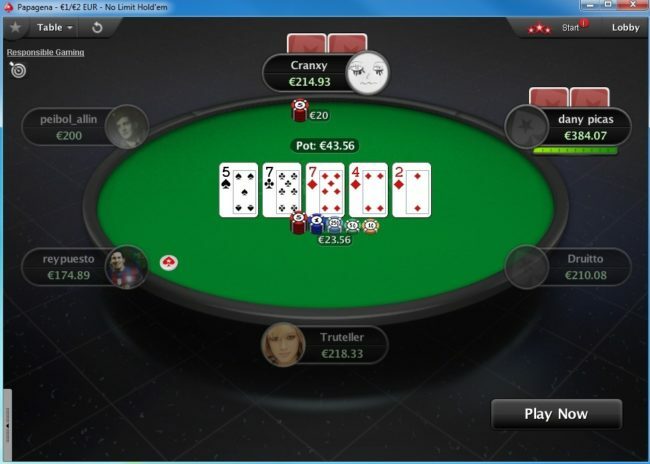 Game at PokerStars.ES goes in euro. Peak of the traffic is late in the evening according to European time. The maximum number of connections can reach 50-60 thousand. The basis of traffic cash in the room are 6-max tables on Texas Hold’em. Because at PokerStars. es “Seat me” function is implemented, then the list of tables is not available, on each limit only the total number of entrance is shown. At low limits up to NL10 inclusive, at short tables in the evening the total number of entrances reaches almost a thousand. 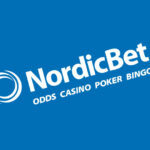 The average number of entries by limits: NL25 -150; NL50 – 140; NL100 – 70; NL200-40; On the NL500-NL1K there are 1-2 tables. 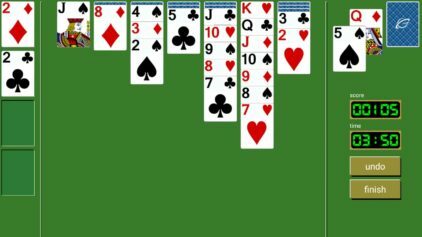 9-max tables are played only the lowest limits. Fast poker (Zoom) is very popular. At low limits (up to NL10), the number of players in it is about the same as at regular tables. On the NL25 you can see up to 150 entries, NL50 to 40. Above in the zoom almost do not play. Although even on the NL500 at peak times there can be up to 20 entries. 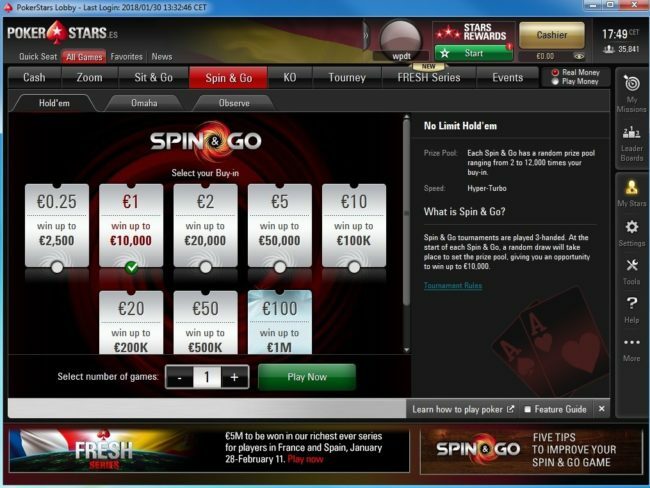 PokerStars.ES poker client and its capabilities are well known to everyone and are rightfully considered by many to be one of the best. Poker trackers and all additional software work on the same way directly as on the .com client. The only difference is the function “Seat me” in the lobby of the cash games. There is no list of tables in it but only different limits and the number of entrances to them. Players are available to the direct box through a standard verification procedure. 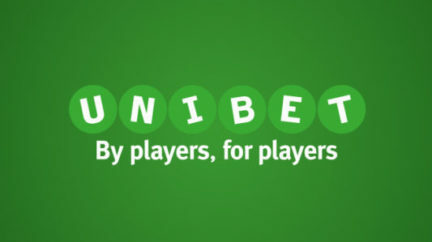 The deposit can be made via Neteller, Skrill, Visa, Mastercard. The withdrawal of funds is available on Neteller, Skrill and Visa cards. PokerStars.es is advantageous as a room with an perfect reputation, an excellent software and a large field at all limits. The most suitable for playing for profit. PokerStars.es is great as an extra room for mitt players of all limits, as well as an alternative for Spin & Go players.